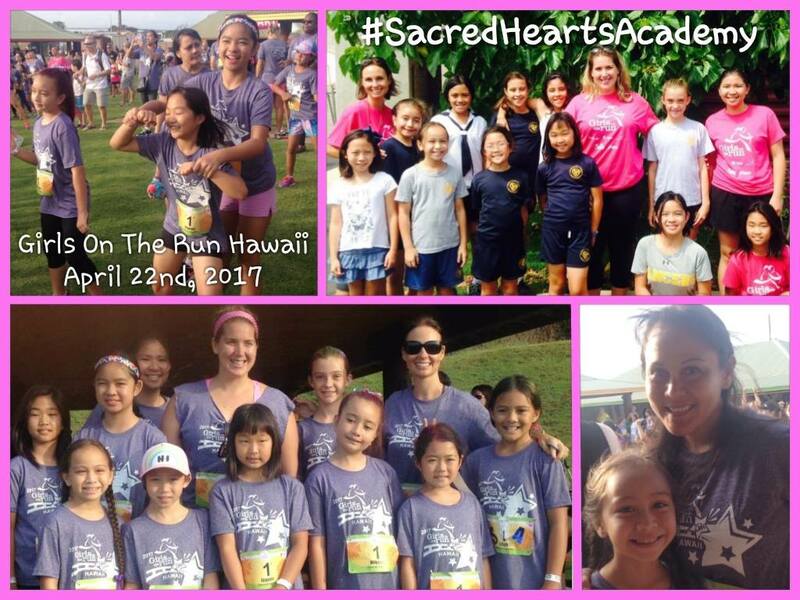 On Saturday, April 22nd, the inaugural Sacred Hearts Academy Girls on the Run team and their “running buddy” parents successfully completed a 5K fun run, held at Wet ‘N Wild. The event involved over 500 participants from around Oahu and included fun activities such as a dance party, yoga, Zumba and the chance to cool off at Wet 'N Wild with free admission to the park after the run. Eleven Academy girls from grades 3-5, alongside their coaches Carrie Knebel (JK Teacher), Fiona Hayashi (Lower School Counselor) and Riki Wong (Counseling Intern) spent the past 10 weeks training for the run, while also taking part in lessons that inspired the girls to become independent thinkers by teaching problem solving skills and healthy decision making. Girls on the Run is an international non-profit organization, with over 200 locations across the USA and Canada. Its mission is to inspire girls to be joyful, healthy and confident using a fun, experience-based curriculum which creatively integrates running.